Following the four seasons of farming. Life on the farm changes from day to day and season to season. 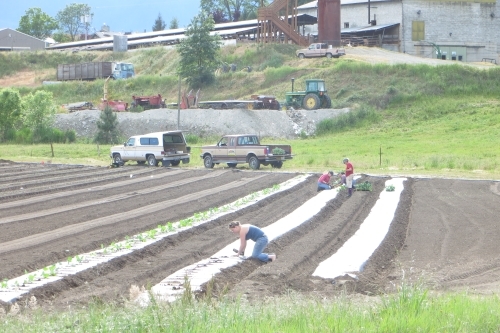 At Fort Vannoy Farms everyone plays an important role and works hard at their daily chores and jobs to be sure the best products are grown for our customers. The dairy barns start the day year round in the early hours of the morning, while most folks are still asleep. The Holstein and Jersey cows know when it is milking time, their udders are full and the cows are ready to eat more feed corn and silage that is produced on the farm. Each cow can produce up to nine gallons of milk a day. As the cycle of the seasons move throughout the year, the farmer's focus may transfer from inside the greenhouses and hoop houses to the pastures and crop fields. Spring and summer are very busy times on the farm. There is a constant rhythm of planting, watering, harvesting, and nurturing all of the berries and vegetables that are grown in the rich soil. The hours of a farmer are from sun up to sun down and beyond! Mid April is when the first of the sweet corn is sowed into the rich dark soil. Meanwhile, the tender little plants are being transplanted from the greenhouse starts to the ground creating patchwork crops that can be seen from The Farm Stand Market. 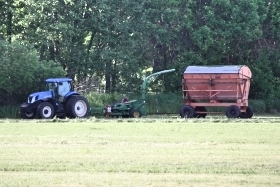 In June, the fields are cut and combed for hay harvest. The farmers are masters at watching and predicting the weather patterns to time the cutting and baling just right for preserving all of the nutrients into the hay for storage. The Farm Stand Market serves as a community center for the Fort Vannoy Community, neighbors and customers. The stand is busy with trimming and cleaning the brightly colored produce as it is delivered from the fields and placed in refrigeration so it leaves the farm with you as fresh and tasty as it can be. There are Grower's Markets throughout the week to find the produce at various locations in the Rogue Valley. 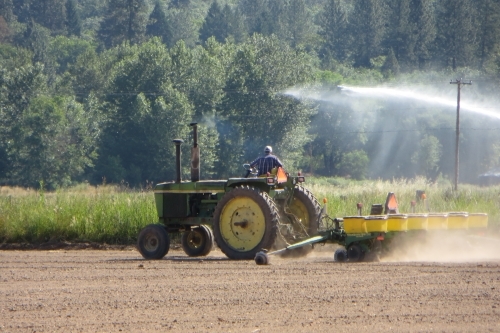 As the season moves into the hot summer days, the fields and crops are watered with the Big Gun Sprinklers and Hose Irrigation. Green can be seen from a distance, but a closer look will bring the color of the blossoms and the fruit on the vine. 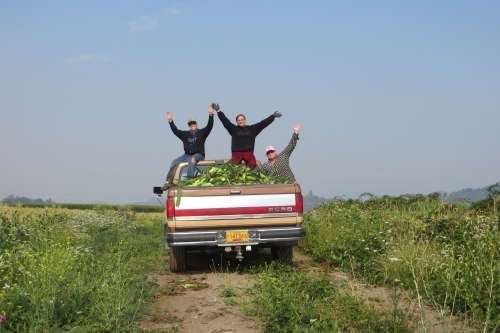 Then the day finally arrives when the first of the sweet corn is picked! When you come out to the farm you just might catch Farmer Bob nibbling on an ear of yellow corn out in the pasture! When summer stretches into autumn, the harvesting time reaches its full peak. 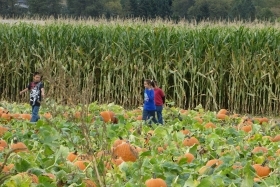 The Pumpkin Patch and Corn Maze are open for family fun, the field corn has reached its full height, and the harvest season is well underway. It is also a colorful time of year with the leaves turning red and gold, and all of the bright orange pumpkins, winter squash, corn and greens being gathered in before the first frost. Autumn is a busy, but satisfying time on the farm as the abundance of hard work is evident in the fall harvest. The winter months slow down for a little while as the land and the farmers rest. The hues of gray, brown, and blue soften the land. The Farm Stand Market closes for December and January. 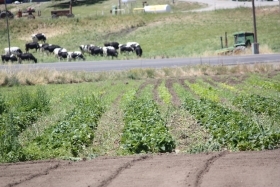 The cover crops sprout and grow. The Winter Root Crops like garlic and onions are growing in the gardens, and the farmers are still rising in the early hours to milk the black and white and brown dairy cows. 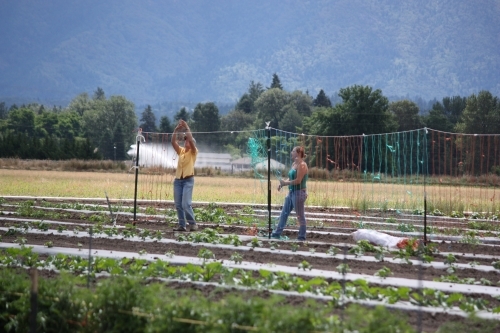 Come out to visit Life on Fort Vannoy Farms and enjoy the view of your food being grown. It takes a full calendar year to produce the variety of food on your table. 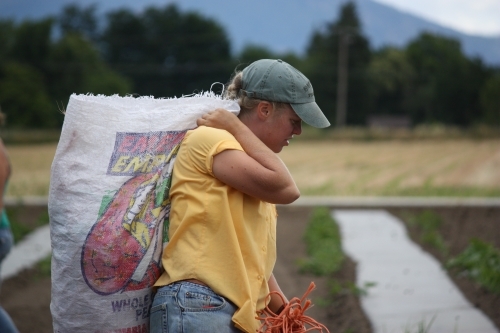 At Fort Vannoy Farms, generations of farming experience go into the local and delicious fresh foods. Come out with your family to experience the Community at Fort Vannoy Farms and see the colors of every season.